Happy Friday, friends! I have a simple and delicious fall-inspired smoothie to share as you head into the weekend. 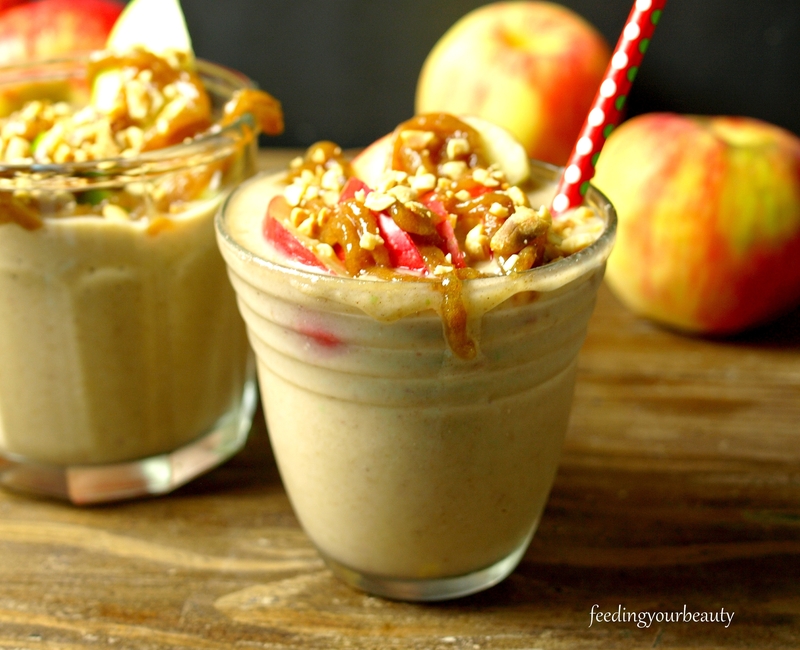 If you love crunchy apples dripping with caramel, then you’re going to love this healthy shake. It scores major bonus points for being a lot easier to eat than a caramel coated apple on a stick. No caramel getting stuck in your teeth or smeared on your face, or apple juice running down your arm. Just grab a straw and sip away. Anyone out there planning to visit an apple orchard, corn maze, or pumpkin patch this weekend? Just how fun does it sound to go for a hayride, run through crispy leaves, and snuggle up to warm apple cider or hot cocoa. I always have these romantic visions of spending the entire fall partaking in such picturesque activities, but we usually barely manage to make it to the nearby apple orchard once a year. The last time we did a drive-by, both parking lots were full and cars were lined up down the road for about a mile. I don’t even want to know what the line looked like for the caramel apples or warm sugar donuts. 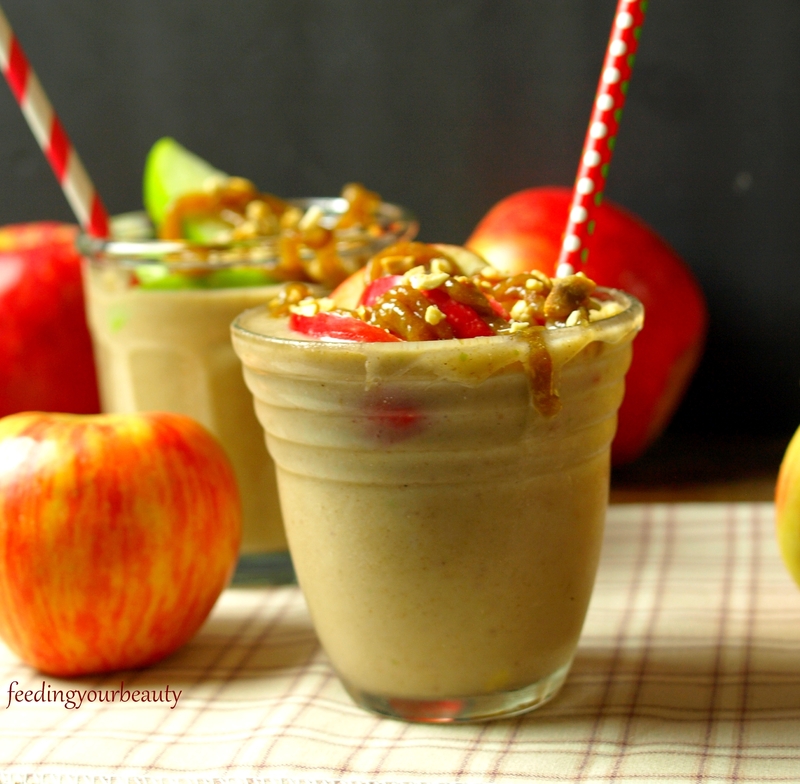 In the meantime I’ll get my fix by munching on honeycrisp apples dipped in my Best Healthy Caramel Dip Ever, maybe bake up a batch of Spiced Apple Donuts, and blend up a big tall glass of this Caramel Apple Smoothie. Too much of a good thing can be delicious. Instructions: blend everything except the frozen apples until very smooth. Add the frozen apples and optional frozen banana and blend until smooth. Garnish with apple slices, healthy caramel, and chopped peanuts. Thank you Grace! I go crazy for caramel apples in every form this time of year!